For use in cuvets, soil, incubators, petroleum products and piercing food samples. 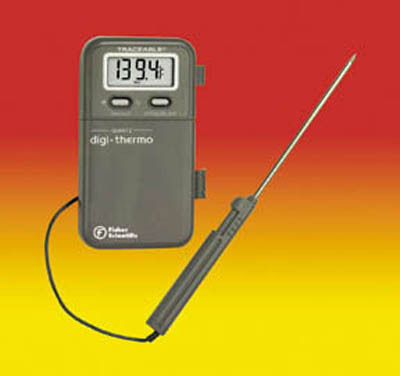 Waterproof thermometers (models 15-077-9E, -9D and 14-648-46) are ideal for wet labs, wash-down areas and outdoor applications in the agricultural, petrochemical, food, and pharmaceutical industries. Individually serial-numbered Traceable Certificate is provided from an ISO 17025 calibration laboratory accredited by A2LA™; indicates traceability to standards provided by NIST™.